IIED and Tanzanian partners recently hosted a national dialogue on artisanal and small-scale mining in Tanzania. Mkhululi Nkosilamandla Ncube reports on the event, and shares his views of how the ASM dialogue process aligns with his work in promoting the Africa Mining Vision. I recently attended a dialogue on artisanal and small-scale mining (ASM) organised by IIED with HakiMadini and MTL Consulting in Tanzania. Participating in the dialogue lived up to what I had heard about the previous ASM dialogue held in Ghana, from the diverse representation of stakeholders, to the depth of topics covered, as well as the mix of field trips and discussions based on the research. During the ASM dialogue contributions, facilitated discussions and research presentations, it became evident to the participants how potent ASM's contribution to local development can be. One could even argue that the potential for achieving national development and regional cooperation presented a 'eureka moment' to the doubting: offering a view of how ASM can act as an engine to improve rural livelihoods. I was at the Tanzania dialogue as part of my work for the ASM workstream at the African Minerals Development Centre (AMDC). African leaders set up the AMDC to implement the Africa Mining Vision (AMV): a pathway for tackling the paradox of Africa's great mineral wealth existing side by side with pervasive poverty. Throughout the side engagements and Q&A sessions directed towards me, it was apparent that only a handful of the 80-strong participants were aware of how the ASM dialogues are in line with the Africa Mining Vision and Country Mining Vision (CMV) processes. The AMV goal for ASM is to "harness the potential of ASM to improve rural livelihoods, to stimulate entrepreneurship in a socially-responsible manner, to promote local and integrated national development as well as regional cooperation". The CMV processes complement this outcome. It is interesting (and at times alarming) that nearly a decade after its adoption by the African Union Member States, very few are aware of what the Africa Mining Vision really is. During the debrief and group session after our field trip to Nsangano gold mine in Nyarungusu village, I gave an impromptu presentation on how the AMDC is the African Union-designated agency to assist countries in implementing the AMV across the continent. The usual follow-up questions are: "How do we go about implementing it? Are countries actually implementing it? How many countries are implementing it?". This is where the Country Mining Vision enters. The AMDC has published a CMV Guidebook that sets out the CMV process. 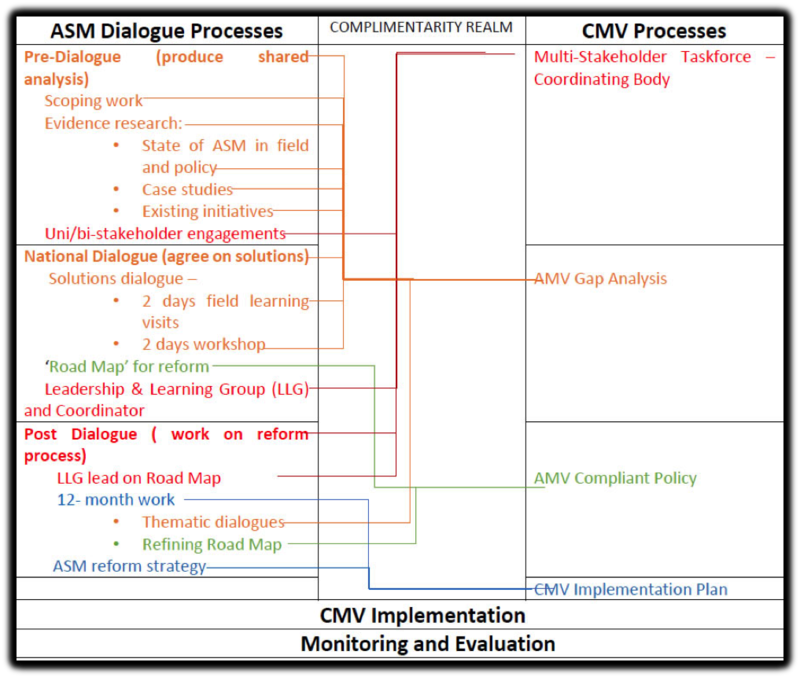 The ASM dialogues and the CMV processes share similar paths towards attaining the vision (figure 1, below). The dialogue process is complementary to the CMV workflow – from engaging key players in research and priority setting, to developing national ownership of a solutions-focused agenda, and promoting multi-stakeholder collaboration for change in both policy and practice. In hindsight, one would say that it is not surprising that the ASM dialogues and CMV processes have logical similarities. One of the chief AMV promoters, the coordinator of AMDC, attended the initial concept meetings for the ASM dialogues and argued persuasively for using the principles in the CMV guidebook as a departure point for designing the dialogues. Ghana and Tanzania were put forward as pilot countries. Thanks to this advocacy, the dialogues started in these countries – with the Ghana ASM dialogues getting a headstart in 2016. We started the dialogue with a two-day field trip. When we returned to the host town of Geita, we found ourselves in a booming rural town whose growth is visible with residential and commercial buildings coming up at every corner. I stayed in a hotel that I later found out to be owned by a former ASM miner who eventually moved from mining using his saved ASM proceeds. Now a hotelier and working in the service industry, he caters to ASM actors within and around Geita district and town. This fascinating discovery gave me an instant relief that I was within a town that practically demonstrated the vision's ASM goal. Despite the usual inimical ASM issues observed during site visits, such as environmental concerns and health risks, it was refreshing to hear of Geita's rapid expansion from being just a rural satellite town of Mwanza, dependent on the large scale Geita Gold Mine, to one whose former ASM miners have become agents of economic expansion. ASM can make a potent contribution to local development – as embodied by Geita. Another case in point: I also pleasantly discovered that a local Geita region school built by an ASM miner recently produced results that were among the top ten performers in the country. 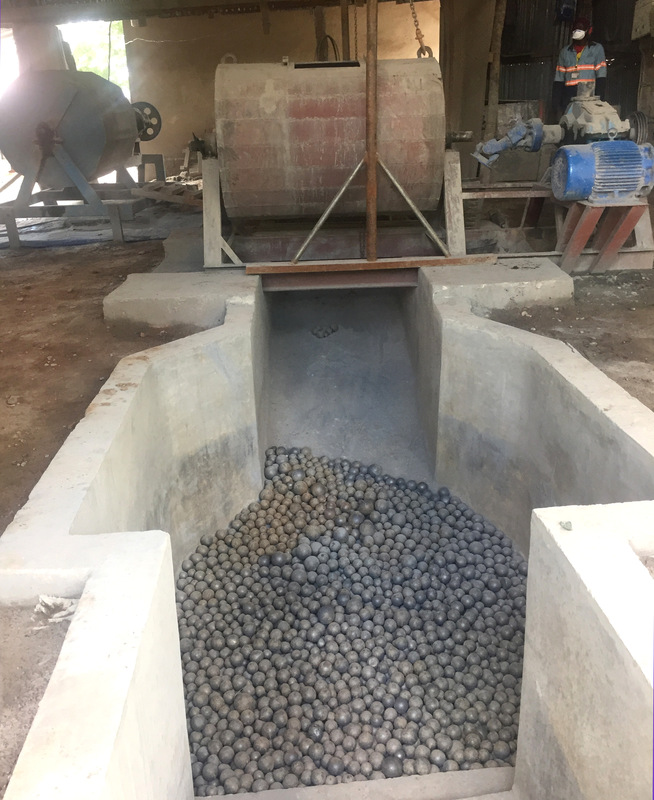 On our site visit to Rwamgasa we saw how ball-mill crushers are now being fabricated at ASM sites by local enterprising mining engineers, while technology is being transferred across borders by Zimbabwean ASM miners coming to consult and sell their ore processing technologies in Geita. These examples are intently aligned to the Africa Mining Vision goal on ASM. We can see how the ASM dialogue processes can complement CMV processes as different sides of the same coin in achieving the Africa Mining Vision. They can both foster mining and minerals extraction to become a tangible and visible vehicle for ensuring – from the grassroots – a transparent, equitable and optimal exploitation of mineral resources to underpin broad-based sustainable growth and socio-economic development. Read a round-up of coverage of the Tanzania ASM dialogue, and view a collection of photos from the event on Flickr. Mkhululi Nkosilamandla Ncube (ncube2@un.org) is with the African Minerals Development Centre (AMDC) working on the artisanal and small scale mining workstream.